Justice League of America #2 sees our new team, sponsored by the US Government, being thrown into the field after they've barely had time to meet one another. It seems the pressure is on to prove the new team's worth and they're being sent out to search for the rumored Secret Society of Super-Villains and stop them before the independent Justice League can get the job done. 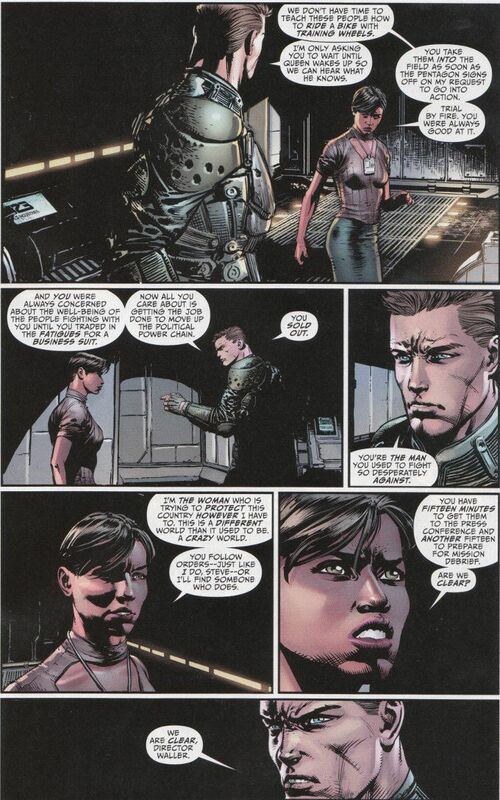 Naturally, all of this is the doing of government liaison Amanda Waller, who pushes for the team to be sent out over the objections of the team's field commander, Steve Trevor. This issue doesn't advance its' plot very far but what this issue lacks in pacing it more than makes up for in character development. There are many great scenes of two people talking to one another where we learn more about our characters and the dynamics between them. Scenes like this are a specialty of writer Geoff Johns, who is always at his best when he's letting the characters be real people with super-powers rather than the generic superheroes that dominate so many team-centered books. I'm hard pressed to pick a favorite moment in this issue but if pushed I'd probably pick the scene where we see Martian Manhunter reading a comatose Green Arrow's mind, trying to learn what he found out about The Secret Society of Supervillains while working undercover. In just a few panels, Johns captures the essence of Oliver Queen - a survivor who will continue to fight, no matter how bad the odds. 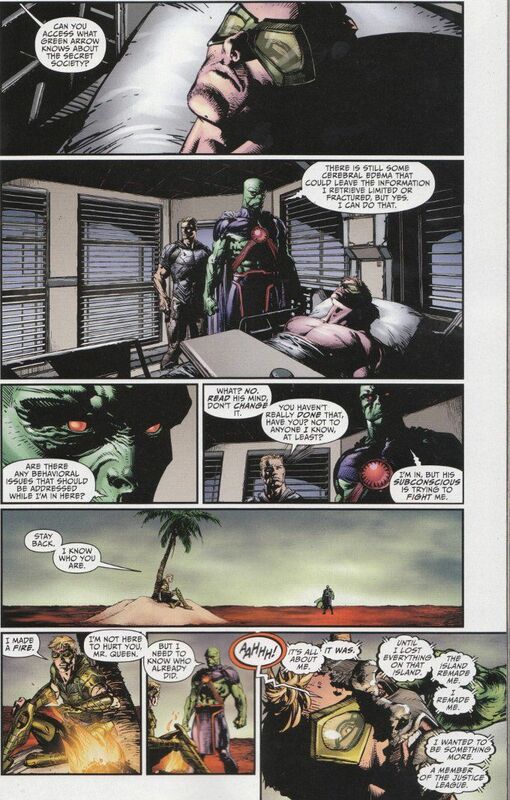 Can he stop Martian Manhunter from invading his mind? Of course not. Does that mean that his subconscious won't at least try and put up a token resistance and set a fire in the hopes that it will stop the pyrophobic Martian? Damn right, it won't! David Finch illustrates the main story with all the detail one would expect given his past work. There are few artists working today who can put this level of intricacy into a small series of panels. One must admire the craft, even if they do not enjoy Finch's grittier style. Personally, I love it. This issue also features a wonderful back-up story by writer Matt Kindt, artist Scott Clark and inker David Beaty. I shan't spoil the story, except to say that it involves one hero taking matters into his own hands to prove the need for an American superhero team in a rather direct manner involving the life of the U.S. President. Kindt deserves praise for the pacing of the story as well as the thought that went into depicting the safeguards a security team would have to account for a world with superpowers (i.e. a floor that detects suddenly shifting weights in the people walking on it to protect against shape-shifters). Clark and Beaty's artwork perfectly captures the story and proves comparable in terms of style and quality to David Finch's work earlier in the issue. If you haven't given this series a shot yet, it's not too late. The cast of characters is interesting, the writing is smart and the artwork is amazing. I'll call it a must read for any fan of the genre.